In our house we love making fresh salads all summer long. We even started getting produce from local farmers markets delivered each week (but that's another post!!!). 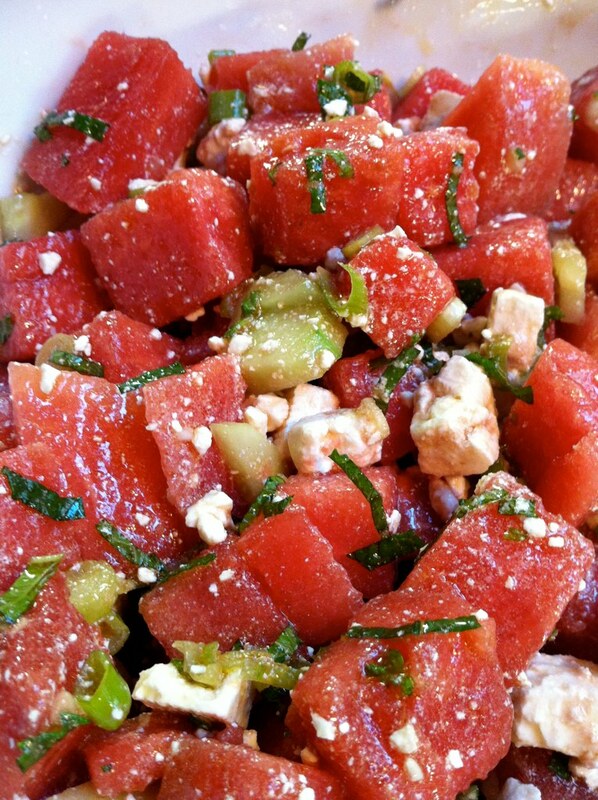 My daughter took a cooking class last June and was given this amazing Tomato-Watermelon salad. It has become a staple in our house during the dog days of Summer!!!! In a large bowl, combine melon & tomatoes, sprinkle with salt, and let it stand. In a smaller bowl, add 4 tablespoons olive oil and all vinegar, herbs and pepper. When the dressing is all mixed pour it into the lemon mixture and let sit in the fridge for up to 2 days. When you are ready to serve your salad, toss the arugula in a medium bowl with the remaining 2 teaspoons of oil. Serve by adding a pile of arugula to the center of the plate, topping with melon mixture, and garnishing with feta and/or almonds.